It doesn’t really matter where you are located; flies seem to thrive almost anywhere. Truly, I think there is really nothing more annoying — except maybe mosquitoes. How can you win the battle without papering the house with fly strips or using toxic sprays to eradicate the pests? Believe it or not, there are herbs that repel flies with the additional benefit of looking beautiful and smelling fantastic. The following fly repellent herbs can be planted just outside the door, in areas such as decks or patios where you tend to sit, or inside on the kitchen window — basically anywhere that you want to repel flies with herbs. The fly repelling qualities of herbs are heightened when the foliage is bruised or moved about, allowing the essential oils — the fly bane — to release. Herbs that repel flies may also be of the dried variety and seem to work just as well. Basil – Basil is a wonderful fly repelling herb plant with numerous varieties, ease of growth and a heavenly aroma. Bruising a leaf and then rubbing it on your skin will provide protection from flies and other biting insects. 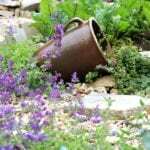 Plant basil in containers or among the garden or border of your picnic area and flies as well as mosquitoes will stay away. Keep the basil plant healthy and bushy by trimming it back and use the pruned foliage in pesto, salad, or to flavor oil. Lavender – Lavender is another herb that will repel flies (and mosquitoes) and looks gorgeous in border plantings or containers. Grow it in the kitchen garden to deter rabbits from munching on tender plants, such as lettuce and spinach. Lavender can be used in cooking and adds a floral/citrus flavor to the dish. You can also hang lavender fresh or dried in the closet or place in bureau drawers to repel moths. The benefits of lavender may also be used to repel fleas by crumbling a bit of the herb onto your pet’s bedding. Rosemary – The strong aroma of rosemary will also repel flies, as will lemon balm. Interestingly, rosemary will also deter cats, so if you want to keep them from using your garden as a litter box, plant some rosemary. Mint, Catnip and Pennyroyal –Mint, catnip and pennyroyal will all repel flies as well as being repugnant to ants and mice. These herbs work well dried as well, but be aware that pennyroyal can be toxic to pets and children. Tansy – Lesser known tansy herb will repel flies, ants, fleas, moths and mice. It resembles marigold flowers and has been used to adorn churches since the middle ages. They can become invasive, however, so keep them in bounds. Bay leaf – Last on our list of using herbs to repel flies is the bay leaf. Bay leaf is not only useful to flavor stews and soups, repel the previously listed pests, but can also be used to keep weevils from invading dried goods such as flour, barley, cornmeal, oatmeal, quinoa, and rice. Just add a dried bay leaf to the containers of these grains. Fly repellent herbs such as those above can be used fresh, dried or made into a salve of their essential oil combined with beeswax and base oil. You can also blend fresh leaves from these herbs with vodka, strain, and then place in a spray bottle to mist areas, yourself, or pets (also livestock) to repel flies. Using herbs to repel flies and other pests and vermin has been used long before we came up with toxic chemicals in a can. Not only do they beautify, but they are environmentally friendly with aroma therapeutic benefit — and no can to dispose of. General Vegetable Garden CareLeaf Browning In Vegetable Plants: What Is Causing Brown Leaves On Vegetables?